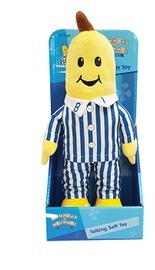 60.71% of people buy Bananas in Pajamas Classic Talking Plush 30cm - B1 and Bananas in Pajamas Classic Talking Plush 30cm - B2. These happy Bananas feature 5 assorted phrases when you squeeze their tummies! Enjoy this new classic design with stitched facial features. Batteries included. Presented in open display box. Suitable for 0 months +.